Nantucket Town Hall is located at 16 Broad Street, Nantucket, MA 02554; phone: 508-228-7255. Photo: John Wendell Barrett House, 72 Main Street, Nantucket, Historic American Buildings Survey [HABS MA-915], V. D. Hubbard, photographer, 1965, memory.loc.gov, accessed January, 2011. As an island and a designated historic district by the National Register of Historic Places, Nantucket is abundant in natural and cultural resources. Natural resources (physical locations) include the coastal areas along the beaches and harbors, the Great Ponds, and five scenic landscapes, designated by DEM. Natural renewable energy resources include wind, solar, wave, and tidal action. 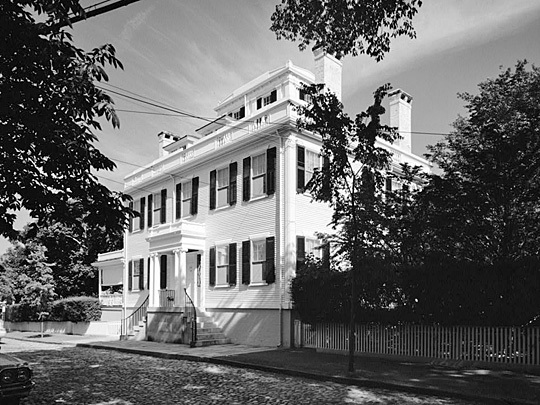 Historic resources include the Island-wide designation as a Historic District by the Commonwealth and a Historic Landmark by the Secretary of the Interior; the Nantucket Historical Association, which owns the Whaling Museum, a research library, and other historic sites and residences, such as Old Mill, Hadwen House; the Atheneum; the Lifesaving Museum; the African Meeting House; three lighthouses; historical burial grounds; and archeological sites, from Native Americans and European settlers. Nantucket has long been a home to artists, writers, actors, musicians, and crafts people. Support for the arts of all kinds should continue on many levels. Survey results showed that residents felt that the Town should have some involvement in the creation of a Community Arts Center, with a majority stating that the town should provide incentives to that end, such as zoning changes or tax relief. Anticipated restoration of the Dreamland Theatre is part of the solution, but more may need to be done. The title is given by the Historian of the State of New York to a controversy that took place among the inhabitants of Nantucket between 1673 and 1680. The two factions were nearly equal. One was under the leadership of Tristram Coffin and the other of Captain John Gardner. On account of intermarriage between the early settlers the hostility was substantially between the Coffin and Gardner families. The animosity that was the origin of the strife cannot be determined, but unquestionably the source lay in the temperaments of the two leaders. Tristram Coffin exhibited great enterprise in gathering together the company of settlers, and his family of five sons and two daughters, with their husbands and wives, formed a considerable part of the first twenty purchasers. He was naturally a leader, and during the first ten years of the island's history was prominent in affairs. It cannot be said that he was popular. He governed by force rather than by persuasion. About the year 1672 he showed irritability of temper by objecting to the voice of the majority and dissenting therefrom, and not satisfied with this dissent, he required that it be entered on the record, "Mr. Coffin enters his decent." He preferred to rule rather than serve, and when Captain John Gardner was gaining in popularity it was a source of consternation to the old Puritan, and in his efforts to retain control of the government he resorted to extreme and revengeful measures. Captain John Gardner was a mariner and lived in Salem, Massachusetts Bay. His brother Richard was in Nantucket in 1665 and was given a house lot. In 1672 the inhabitants invited Captain Gardner to settle on the island "to set up the trade of fishing for the taking of codfish," and that he should stay on the island at least three years. For this he was granted half a share of land. Then he purchased the half share of Nathaniel Holland, on which the latter had built a house. Richard Gardner came to Nantucket in 1665 as a seaman and became a landowner. In 1673 a grant of regular shape was made to him comprising the land surrounding Lily Pond, then called Wesco Pond. His house was on Sunset Hill, just west from the Coffin house. Peter Folger was the son of John Folger, and came to this country with Reverend Hugh Peters and afterward married Mary Morrill, a servant in Peters' family. Peter Folger settled at Martha's Vineyard (Dukes County) and became very proficient in the Indian language and also learned the arts of miller and blacksmith. When Thomas Mayhew transferred Nantucket to the first twenty inhabitants, it was arranged that Peter Folger should accompany them and assist in managing the Indians. A half share of land was granted him providing he would assist the inhabitants as interpreter, miller and blacksmith. His son Eleazer was given a half share of land providing he would pursue the industries of blacksmith and shoemaker. Folger's mother having died about 1663, he sold his lands at Martha's Vineyard and removed to Nantucket. Peter Folger was a surveyor and a preacher. His grandson, Benjamin Franklin, thought that Folger came from Holland. The natural abilities of the Gardner brothers and Peter Folger and their acquirements very soon enabled them to become persons of great importance. It was true they were tradesmen and possessed only one half as great a share of land as the first twenty purchasers, yet there was great demand for the service which they could render. In managing the Indians, Peter Folger seems to have been without an equal. John Gardner, also, was held in high esteem among them, and as long as he and Folger were able to advise the Englishmen there was no conflict. Richard Gardner appears to have been a man of considerable education and was many times Chief Magistrate and Assistant. The Gardner brothers and Folger had qualities that made them popular. Captain John had evidently not received much school education, but he seems to have been a man of physical courage and rugged honesty that gained for him public confidence. After the death of Peter Folger, he was the protector of the Indians. During the 30 years of his residence at Nantucket, he was out of office for only a few years. He was Chief Magistrate, Selectman, Treasurer, and Deputy to New York. Twice traveling Quaker preachers visited Nantucket, once in 1680 and again in 1704. He forcibly objected to the new sect and protested against their establishment on the island. These three men seemed to affiliate naturally, being of democratic views, while Tristram Coffin was inclined to be despotic. Under such circumstances it was inevitable that men of strong personality like Tristram Coffin and John Gardner should ultimately come into conflict. Coffin would not tamely submit to the increase in popularity of John Gardner, and it was not likely that Gardner would retire in order that Coffin might retain power, the power and authority that were first accorded to him. It was an annoyance to Coffin to see the favor shown to Captain Gardner. The town granted him 20 acres from his house toward the cliff and widened the road that passed by his warehouse to the landing place. Under the new system of courts the people elected 2 men, one of whom the Governor of New York appointed Chief Magistrate. The first election took place in the spring of 1673 and Richard Gardner and Edward Starbuck were elected. The Governor selected the former and at the same time appointed John Gardner chief military officer. The Gardners decided to engage in the fishing business and for some reason concluded to procure a license from the Colonial Governor. They were authorized to conduct the fishing business and to buy land on the shore from the Indians. In the same letter came the commissions of Richard Gardner as Chief Magistrate and John Gardner as Captain of the Foot Company then within the islands of Nantucket and Tuckannuckett. This was in April, 1673. In July, 1673, the Dutch captured New York, and for several months matters of government were in confusion. In October, 1674, New York was surrendered to the English. Thus the town charter was in question and the town voted Gardner to attend to the Governor at New York to clarify matters. Coffin and his supporters were afraid that Gardner might negotiate some personal advantage while the government of New York was yet in a condition of some turmoil. Much contention continued pitting the Coffins and the Gardners against each other, continually petitioning the Governor and commissioners, for many years through 1680. Tristram Coffin died in 1681 and within the following decade Richard Gardner, Thomas Macy, Peter Folger and Thomas Mayhew, all protagonists in the great "insurrection," had also passed away. Thus ended the Nantucket Insurrection. In 1686 a few rods east of the homestead of Richard Gardner was built a house, for those days pretentious and elegant. In the chimney was a device in later days called a horse shoe. Tradition says the land was donated by Captain John Gardner, and the house built from lumber sawed in the mill of Peter Coffin. In this house lived Jethro Coffin, grandson of Tristram, the great dissenter, and his wife Mary, the daughter of Captain John Gardner. Nantucket Planning Board, Town of Nantucket, Nantucket Master Plan, 2009, www.nantucket-ma.gov, accessed January, 2011. Henry Barnard Worth, Nantucket Lands and Land Owners, Volume 2, Bulletin Number 1, Nantucket Historical Association, 1901.